Then consider becoming a member the Nebraska Methodist Hospital and Methodist Women’s Hospital Decontamination Team. The training is done in a fun learning environment and benefits the safety of the hospital and community. 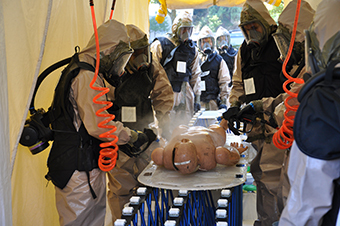 Pass a medical respirator examination, complete respirator fit test and demonstrate competency to Don and Doff decon suites. Attend monthly meetings/training sessions, each 1.5 hours of paid time. Attend at least one of the two drills each year, typically on Saturdays or during a predefined time. Active participation in all actual events when applicable. Complete National Incident Management System(NIMS) independent study 100, 200 and 700 courses.